These Crockpot Swedish Meatballs are made lighter using half the heavy cream and extra-lean ground beef meatballs made from scratch. 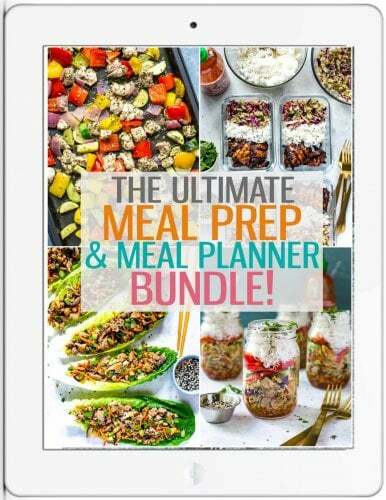 Serve with a side of egg noodles and broccoli for a full meal! So who out there loves IKEA's Swedish Meatballs?! I mean, if you're gonna eat there they are pretty much an absolute staple and you've gotta order them right? Unfortunately for me IKEA is a little too far of a drive outside the city so I don't often get to indulge in them! 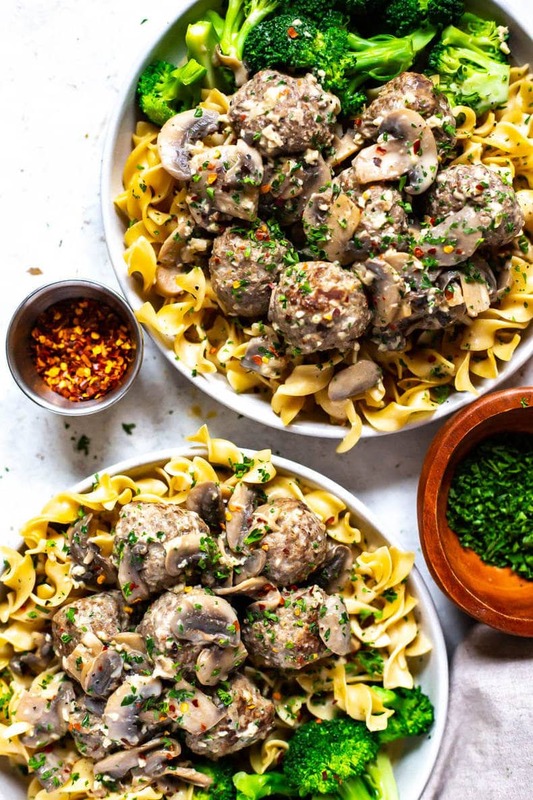 Well, what's a food blogger to do than make herself a big batch of freezer-friendly Swedish Meatballs – and in the slow cooker to boot! 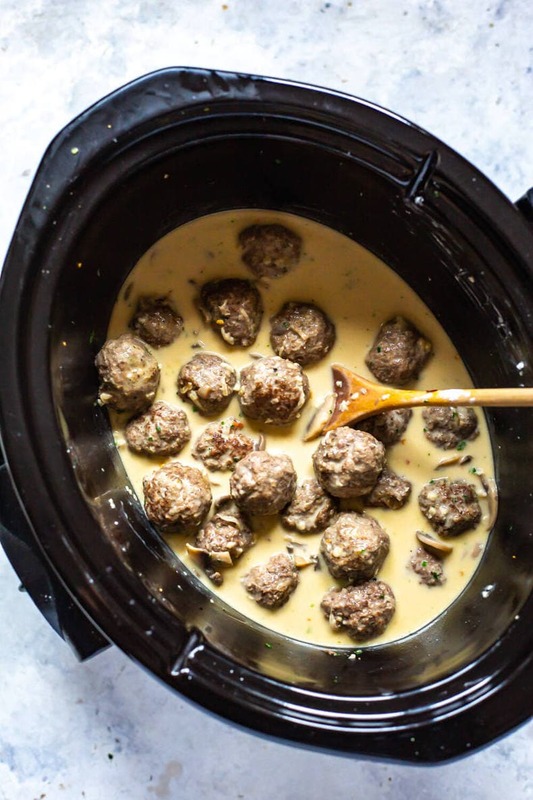 Technically you could also make these Crockpot Swedish Meatballs on the stovetop so if you're interested in an alternative method of making them keep reading to find out how to make them ASAP! 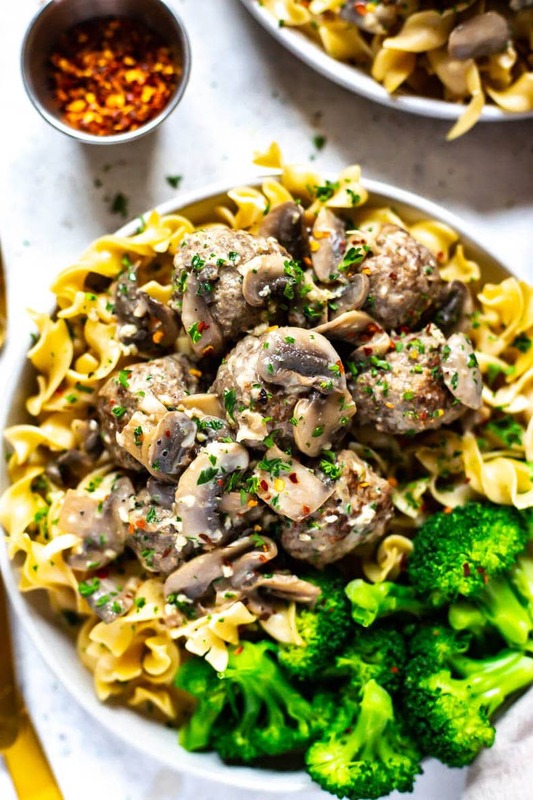 These Crockpot Swedish Meatballs are similar to this Crock Pot Beef Stroganoff in terms of the sauce and ingredients – both recipes are comfort food favourites that can be made in the slow cooker so you can come home looking forward to a delicious meal that has cooked while you are out all day! 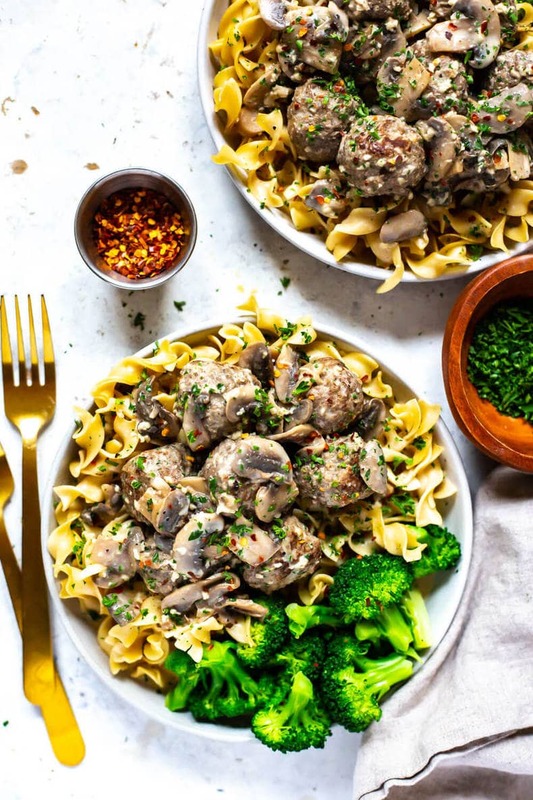 These Crockpot Swedish Meatballs are pretty easy and straightforward to make – besides the heavy cream, most of the ingredients that go into this dish are pantry staples. You can even substitute sour cream for the heavy cream at the end – just make sure you double the sour cream because it is a lighter alternative to the heavy cream and you'll need more of it! You'll notice that I've used ground beef for these Swedish meatballs but you really can use any type of ground meat, from ground pork to ground turkey. The choice is up to you! The key ingredients are the beef broth, Worcestershire and heavy cream (or sour cream) so just make sure to have these ingredients on hand and your pantry should take care of the rest! 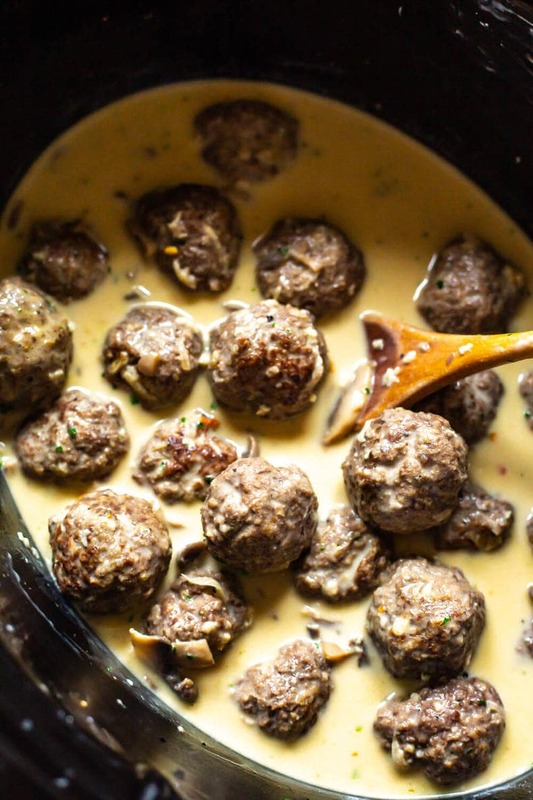 These Crockpot Swedish Meatballs don't have to be made in the slow cooker! If you don't have one or didn't have time to get your meatballs in the slow cooker at the beginning of the day, there's no need to fret. These Swedish Meatballs are super easy to make on the stovetop too. The main difference here is that you will be making the Swedish meatball sauce in a separate saucepan while the meatballs cook in a frying pan (you could also cook them in a 400 F oven for 20 minutes or so). You will also be cooking your meatballs for much longer since they won't be slow cooking – about 15 minutes on medium heat should be more than enough. In a separate saucepan, you'll saute the mushrooms with butter until the juices release, then add in the garlic and saute another 30 seconds. Pour in your beef broth, Worcestershire, salt & pepper then bring to a boil and simmer for 10 minutes. The meatballs and sauce should be cooking at the same time. Like the slow cooker method, you'll mix up a cornstarch slurry and add that along with the cream to the sauce, and add your meatballs. Cook up your egg noodles and broccoli, then serve it all together and enjoy! See the stovetop version works, but it is a lot more hands on and time consuming. Part of the appeal of the crockpot version of Swedish meatballs is that you can also complete the recipe in a number of different steps so it doesn't seem so overwhelming. For instance, I usually make a double batch of the meatballs and cook them ahead of time and put them in the freezer for future use. You can also cook them up to 3 days in advance and store them in the fridge before you put them in the slow cooker. Once you get your meatballs, you just cook them in the sauce and from there you have tons of time to get the egg noodles and broccoli cooked. 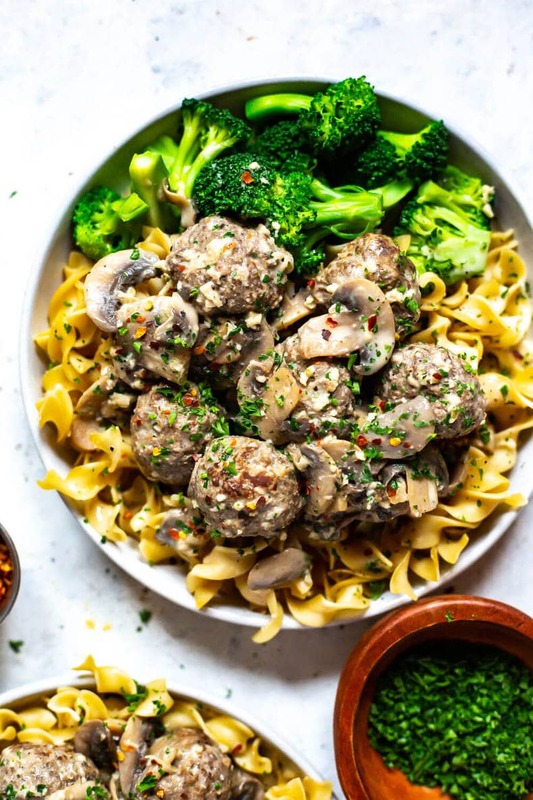 It's handy to cook the egg noodles and broccoli together because both only require 3-4 minutes in boiling water, and this way you can turn these Crockpot Swedish Meatballs into a full meal. 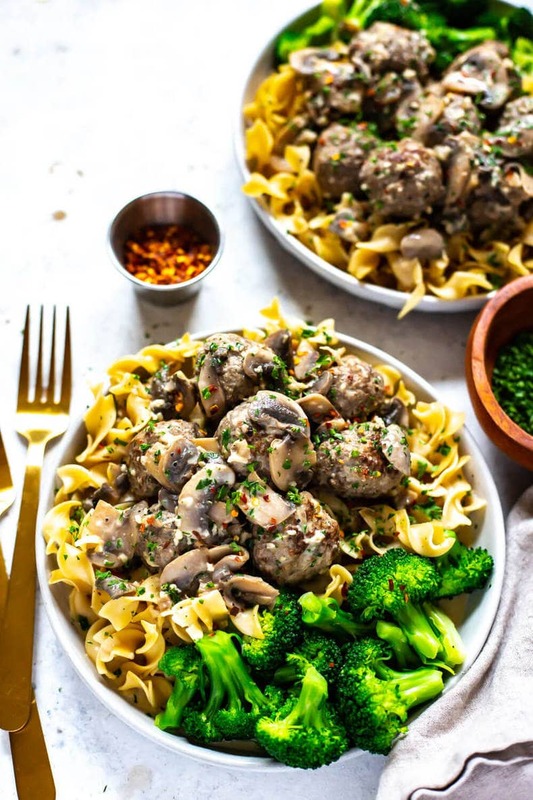 You definitely don't need to serve your crockpot Swedish meatballs with the broccoli and egg noodles – some people love to eat them with a side of mashed potatoes and other veggies, and you can also serve these Swedish meatballs alone as an appetizer! Just serve right from the crockpot with a side of toothpicks for people to help themselves. They really are the perfect party food! 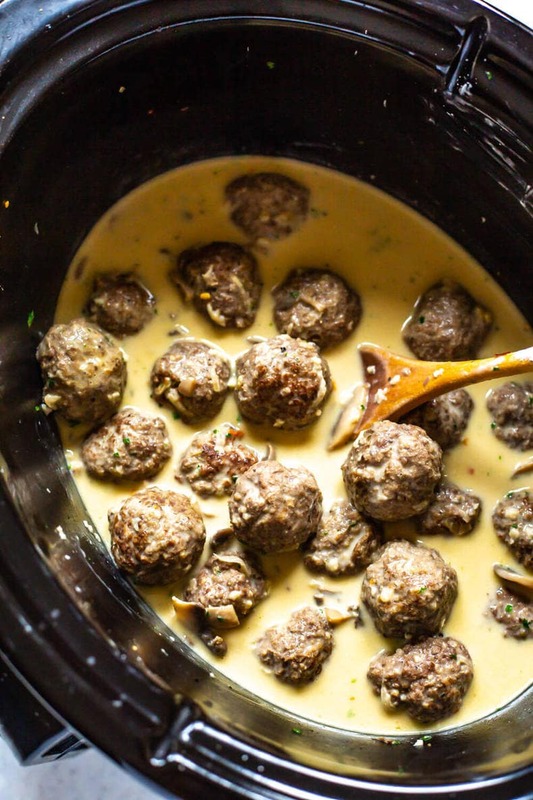 Will you be making these Crockpot Swedish Meatballs? 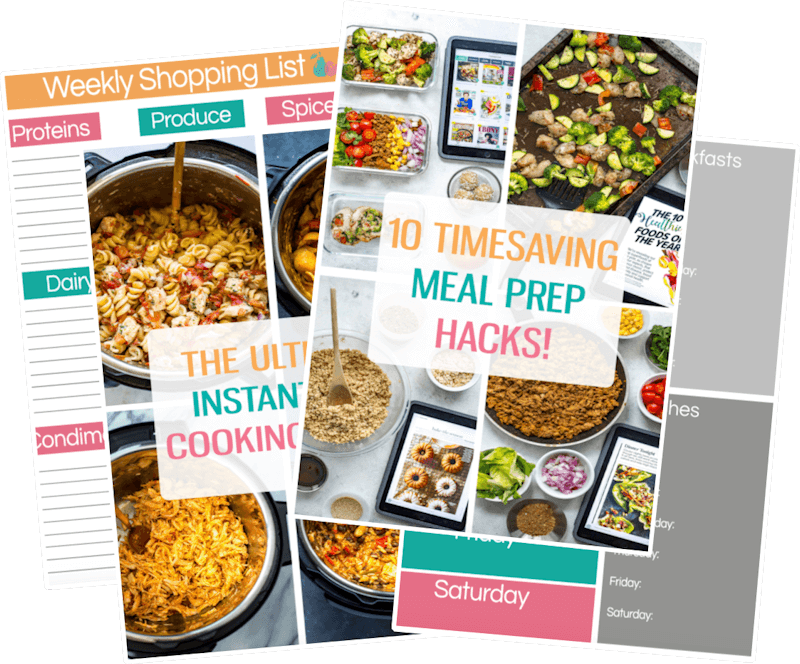 And if you're looking for more delicious crockpot recipes I have this round up of healthy Slow Cooker Recipes that you can use for your weekly meal prep or even just a last minute dump dinner idea! 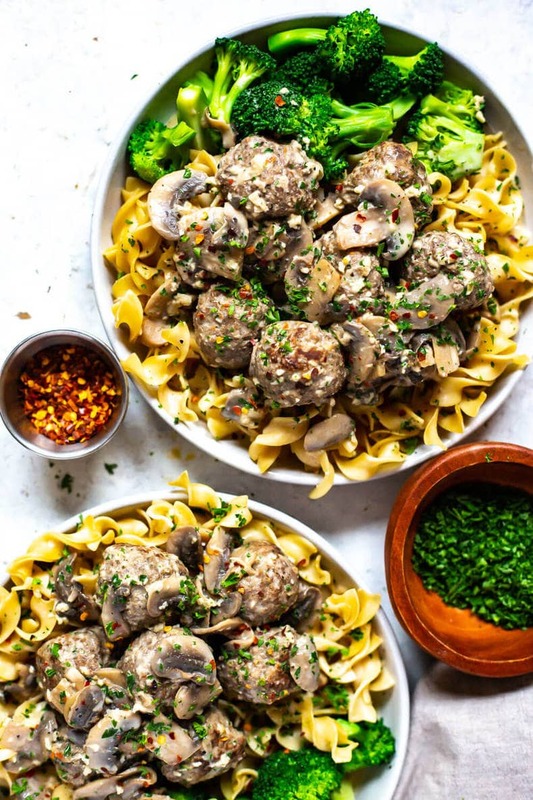 Grab some glass meal prep bowls if you plan on packing these Swedish Meatballs in the freezer and defrosting in the microwave. Mix together ingredients for meatballs in a large bowl, then roll into 2-inch balls. Spray a very large skillet with cooking spray then heat on med-high. Cook meatballs for 3-4 minutes per side (they should all be lightly browned but not cooked through - you may need to do them in batches depending on the size skillet you have). Grease slow cooker with non-stick cooking spray (or just extra butter), then add butter, mushrooms, beef broth, garlic, Worcestershire and salt & pepper. Add meatballs and drippings, then cook on high for 2 hours or on low for 6 hours. Meanwhile, mix cornstarch and water together in a small bowl to create a slurry. Boil egg noodles for 3-4 minutes, adding broccoli florets in during the last 2 minutes of cook time. Drain and set aside. Once meatballs are done, add cornstarch slurry and heavy cream, tossing meatballs gently to combine sauce. Serve over egg noodles and broccoli, garnishing with fresh parsley if desired. Enjoy! NOTE: These Swedish Meatballs are also great to serve at a party! Leave out the egg noodles and broccoli and just serve out of the crockpot with toothpicks.